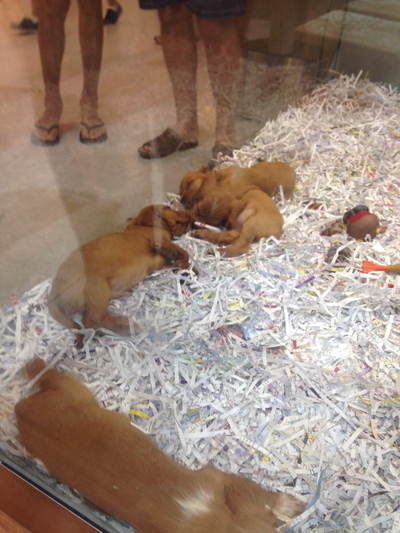 There are a few quality pet shops in Sydney where you can buy a rescue cat or dog. In other words you're adopting a pet. Otherwise you can buy one that has come directly from a breeder. If you own at least one pet, and you brought it from a pet shop; which pet shop did you buy it from? Otherwise if you're wanting to buy a pet from a pet shop in Sydney, which pet shop would you go to first, and why? The Animalia in Hurstville is a high quality pet shop. I actually used to work there, so I know how well they treat their animals and how knowledgable they are about pet care. Also, for rescue dogs I would recommend the RSPCA in Yagoona, which has heaps of dogs and cats available who all are in desperate need of good homes. The staff are always willing to show you an animal and help you out with the adoption process. Pets Paradise in Chatswood brought in some beautiful Ragdoll cats recently. Also like Room 4 Pets at Westfield in Bondi Junction - they sell rescue animals for a cheap price, and they're also microchipped with the required vaccinations. I bought my two birds from Dural Pet store on quarry road. They are very helpful with advice when choosing a pet and then on you can go to them anytime with any issues you have. The staff their clip the wings of my birds when needed too. Try Kellyville Pets. They have a huge selection of birds. I bought my hand reared rainbow lorikeet there. Please be careful about buying puppies from pet shops. I would always try to rescue a dog from the RSPCA at Yagoona etc first. The Cat Protection Society in Enmore isn't a pet shop per se, it's a place where you can adopt a rescued cat or kitten. They take really good care of all their cats and do detailed biographies of each one so you know what sort of new friend you're getting. :) I highly recommend them if you're looking for a kitty-shaped furrever friend. Best iced coffee in Sydney? Best free wifi in Sydney? Best free entertainment at Sydney's Pitt Street Mall?